Jazzcamp 2014 is now open for student registrations! The ‘camp’ (non-residential) is designed for aspiring young jazz musicians from ages 11-18 and runs from Monday 7th to Friday 11th of July at WAAPA in Mount Lawley. 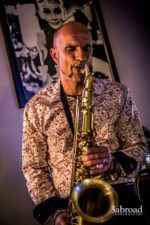 Jazz Camp consists of a series of clinics, master classes, performances and jam sessions delivered by some of Australia’s finest jazz performers and educators. Students will get the chance to perform together in small and large ensembles, improve their technique on their chosen instrument, learn about and experiment with jazz improvisation as well as meet other young aspiring jazz musicians from metropolitan and regional schools across WA. Students will also get information about auditioning for WAAPA and WAYJO, if that’s what they’re aspiring to, otherwise it is simply a fantastic opportunity to learn, play and have fun with jazz music and improvisation. Jazzcamp has been running annually since its inception in 2001 and many Jazzcamp alumni have gone on to graduate from the WAAPA jazz program and establish successful musical careers in Australia and around the world. This years tutors are: Penny King (voice), Marty Pervan (trumpet), Jordan Murray (trombone), James Sandon (saxophone), Freddie Grigson (guitar), Russell Holmes (piano), Daniel Susnjar (drums) and Pete Jeavons (bass).